Capillaries and veins are two components of the circulatory system of animals. During systemic circulation, the blood pumped by the heart passes through the aorta to the arteries and arterioles, which drain blood to each of the organs and tissues of the body. 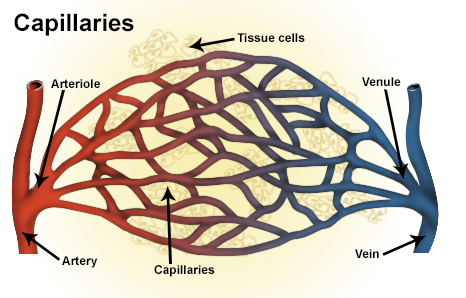 Within the tissues, the arterioles produce a fine-branched network called capillaries by which the venules begin. The venules form veins. The veins drain blood back to the heart. The main difference between capillaries and veins is that capillaries are involved in the microcirculation whereas veins are a component of the systemic circulation. During microcirculation, oxygen and other nutrients move from the blood to the extracellular fluid of the tissue while the metabolic wastes such as carbon dioxide and urea move from the extracellular fluid to the blood. The capillaries are the fine-branching network of blood vessels that form a network between arterioles and veins. They are found in tissues and organs, near the metabolizing cell. Since the diameter of a capillary is 5-10 μm, only a single file of blood vessels can pass through a capillary at a time. The wall of the capillary is made up of simple squamous epithelium. 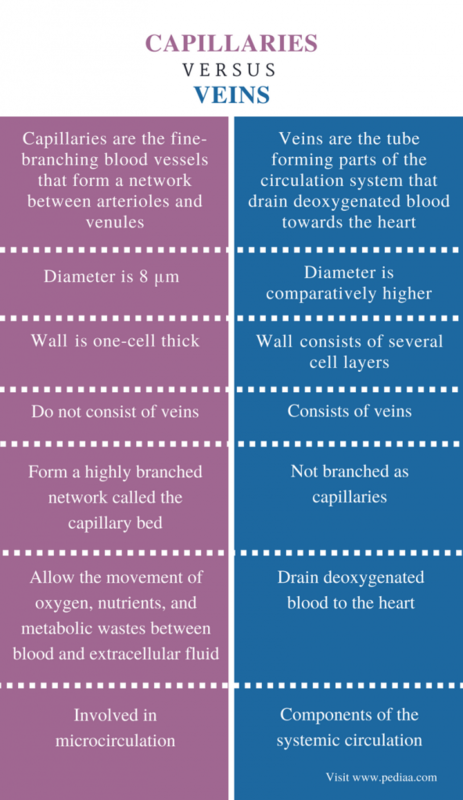 Therefore, the wall consists of a basement membrane and endothelial cells. 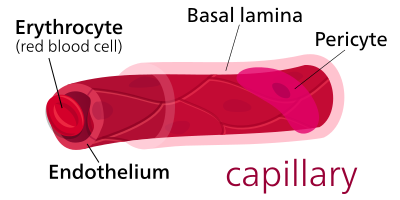 The structure of a capillary is shown in figure 1. The major function of capillaries is to facilitate the movement of substances between the blood and the extracellular fluid of the tissue. Oxygenated blood and nutrients come to the capillaries through arterioles. The network formed by the capillaries at the tissue is called the capillary bed. The fluid that moves from blood to the extracellular fluid through the capillary wall is called the interstitial fluid. The interstitial fluid consists of oxygen, nutrients, ions, and water. Metabolic wastes such as carbon dioxide and urea move from the extracellular fluid to the blood. This process is called microcirculation. The capillary exchange is shown in figure 2. Three types of blood capillaries can be identified in the human body: continuous, fenestrated, and sinusoidal capillaries. The continuous capillaries comprise a continuous endothelial cell layer, lining the capillary lumen. This type of capillaries is found in the skeletal muscles, skin, gonads, and fingers. They only allow the movement of water and ions through the intercellular cleft. The fenestrated capillaries comprise small pores, 60-80 nm in diameter in the endothelial cells. They allow the movement of ions as well as small proteins through the fenestrations. The fenestrated capillaries are found in the endocrine glands, pancreas, intestine, and the glomeruli of the kidney. The sinusoidal capillaries comprise large openings in the endothelium and incomplete basement membrane. This type of blood capillaries allows the movement of red blood cells, white blood cells, and serum proteins. They occur in adrenal glands, bone marrow, and lymph nodes. The three types of blood capillaries are shown in figure 3. Veins are the blood vessels that drain deoxygenated blood towards the heart. After undergoing microcirculation, deoxygenated blood is collected in the venules along with other metabolic wastes. The venules are small blood vessels branched out from the veins. They drain the deoxygenated blood to the veins. The pressure of the venous blood is lesser than that of arteries. The major driving force of the blood in the veins is the muscle contractions. Veins comprise valves, which prevents the reverse blood flow. The formation of a vein from blood capillaries is shown in figure 4. The diameter of a vein may vary from 1 mm to 1.5 cm. The vein wall is made up of three tissue layers: tunica adventitia, tunica media, and tunica intima. The tunica adventitia is composed of connective tissue layer and forms the strong outer covering of the vein. The tunica media is composed of a thin smooth muscle layer and the tunica intima is composed of a lining of a smooth endothelial layer. The veins drain blood to the largest veins called vena cava. The superior and inferior vena cava drain blood to the right atrium of the heart. 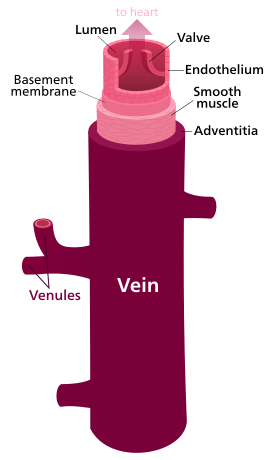 The anatomy of a vein is shown in figure 5. Capillaries and veins are two vessel components of the circulatory system. Both capillaries and veins are thin-walled structures. Both capillaries and veins help in circulating substances throughout the body. Both capillaries and veins are involved in the homeostasis of the body. Capillaries: Capillaries are the fine-branching blood vessels that form a network between arterioles and venules. Veins: Veins are the tube forming parts of the circulation system that drain deoxygenated blood towards the heart. Capillaries: The diameter of a capillary is 8 μm. Veins: The diameter of a vein is higher than that of a capillary. Capillaries: The wall of the capillary is one-cell thick. Veins: The wall of the vein consists of several cell layers. Capillaries: Capillaries do not consist of veins. Veins: Veins consist of valves. Capillaries: Capillaries form a highly branched network called the capillary bed. Veins: Veins are not branched as capillaries. Capillaries: Capillaries connect arterioles and venules. Veins: Veins drain the blood in the venules towards the heart. Capillaries: Capillaries allow the movement of oxygen, nutrients, and metabolic wastes between the blood and the extracellular fluid. Veins: Veins drain deoxygenated blood to the heart. Capillaries: Capillaries are involved in microcirculation. Veins: Veins are the components of the systemic circulation. Capillaries and veins are two vessel components of the circulation system. Capillaries are single cell-thick structures whereas veins are made up of three types of tissues: connective tissue, smooth muscles, and simple epithelium. Capillaries receive oxygenated blood from arterioles along with nutrients. Both nutrients and oxygen move from the blood to the extracellular fluid through the wall of the capillaries. The metabolic wastes move to the blood at the same time. The deoxygenated blood drains to the veins through the venules and is then transported to the heart. The main difference between capillaries and veins is the role of each type of blood vessel in the circulation system. 1. Bailey, Regina. “What is a Capillary Fluid Exchange?” ThoughtCo, Available here. Accessed 30 Aug. 2017. 2. “Capillary.” Wikipedia, Wikimedia Foundation, 28 Aug. 2017, Available here. Accessed 30 Aug. 2017. 3. Bailey, Regina. “Types of Veins That Keep Your Heart Ticking.” ThoughtCo, Available here. Accessed 30 Aug. 2017.